Duke’s regular season didn’t go as anticipated, but the Blue Devils are rounding into form at just the right time. Who else in the ACC seems most capable of a deep NCAA tournament run? BROOKLYN — It was supposed to be here, not just on top of its conference but on top of the sport, or such was the consensus before a single ball had been tipped. Duke entered this season with a No. 1 ranking and the frontrunner for the player of the year, such a collection of talent on the roster and mastery at the helm that surely they would cruise through the season as a contender for the national title. But the Blue Devils’ journey to March was treacherous, marked by injury and incident, and so when the players gathered on their benches’ folding chairs after beating Notre Dame 75–69 in a brilliant ACC championship—their game uniforms now replaced by blue commemorative T-shirts, their heads now capped by gray commemorative hats—amid the smiles and raised hands and occasional shimmies to the Jay Z song blaring throughout the arena, they basked in a moment of glory while rehashing those of trepidation. They did it by winning their fourth game in four days, a first in the ACC tournament’s storied history, and they did it while looking for the first time like the potential seven-headed hydra many expected to see in the fall. Sophomore guard Luke Kennard scored his steady 16 points, and when he missed, there was freshman Jayson Tatum slamming down a caroming miss for two of his team-high 19. Grayson Allen came off the bench yet again to score 10 points, including a high-arcing floater over a rising cluster of Irish arms as the horn sounded to end the first half, and before that he found Giles for a baseline alley-oop that helped establish Duke’s early control. And when Notre Dame surged to recast the second half as a horse race, there was senior forward Amile Jefferson hitting a fall-away, turnaround hook shot and swatting away a layup from behind; and freshman Frank Jackson driving to reclaim the lead as the game entered its final five minutes; and senior guard Matt Jones, previously scoreless on the night, stepping out of the shadows to drain a three that quadrupled Duke’s lead to four in the final minute. It was a takeover by talent, by design. Their path to that takeover has been well-chronicled: injuries that delayed Tatum and Giles’s debuts, the repeated tripping incidents that earned Allen the season’s most talked-about suspension, Krzyzewski’s seven-game absence after back surgery, Jefferson and Allen’s own maladies. Duke entered this tournament as its fifth seed, having dropped three of its final four regular-season games, with growing speculation and clamor over what might be ailing them and when or whether Allen might recover from a nagging ankle injury. It left it having made ACC history, knocking off a trio of top-notch opponents, including its most fierce rival, who is a clear consensus choice for a No. 1 NCAA tournament seed. Now there will be a day of debate about just where this rising Duke team should be seeded itself. In four days it has gained a sudden media bandwagon making its case as a No. 1, and with good reason, given what is now a 13–6 record against top-50 teams. (Its case may have also been indirectly bolstered by the day’s news that Oregon forward Chris Boucher will miss the remainder of the season with a torn ACL, which will not go unnoticed by the selection committee.) The answer will come soon enough, less than 24 hours after the Blue Devils gave reason to hang still another banner back in Durham, and after giving plenty to reason to believe it might have cause to hang more. What made Duke’s run all the more impressive is the quality of pelts it collected along the way. Krzyzewski described the Blue Devils’ final three opponents—Louisville, North Carolina, and Notre Dame—as “Final Four quality” during his post-game interview, and the Irish had spent the previous two and a half hours making it hard to disagree. With all due respect to the Tar Heels (who, inattention in this space notwithstanding, may be the best team in the country), Notre Dame was as impressive as any other non-champion on display in Brooklyn this week. The Irish play an aesthetically pleasing brand of small-ball, led by 6’5” forward Bonzie Colson, an undersized, flash-less doer who beguiles larger opponents with a bevy of crafty moves and sneaky shooting range. Had the Irish won, his 29-point, nine-rebound effort would have been the talk of the night, but it being overshadowed is somewhat fitting, given how Colson’s team seemed to sneak into the finals while so many eyeballs were watching the higher-wattage programs elsewhere in the bracket. Notre Dame’s path to Saturday’s game was impressive in its own right, coming as it did by having cracked the code of Virginia’s stout defense (at least for a night) and having buried a long and rangy Florida State team under a barrage of three-pointers. Notre Dame’s season-long profile has its faults; the Irish lost five of six at one point, and their defense ranks just 58th nationally in efficiency. But the team that spent Saturday trading blows with a Duke team many are now ticketing for the top seed line is one that can threaten to reach the program’s third consecutive Elite Eight, and maybe finally break through. How far can defense carry Virginia? When much-ballyhooed Memphis transfer Austin Nichols was dismissed from the team by coach Tony Bennett just a week into the season, the Cavaliers’ prospects for breaking through to their first Final Four since 1984 took a significant hit. While Bennett was able to more than adequately patch his defense with 6’11” sophomore Jack Salt and 6’9” freshman Mamadi Diakite anchoring inside, Virginia’s offense has been another story, ranking 38th nationally and 11th in the ACC. After finishing 22–10 (and just 6–7 over the last six weeks), the Hoos should be looking at a No. 5 seed on Selection Sunday, the kind of placement that fittingly often indicates a power-conference team with a wide range of potential outcomes. When Bennett’s Pack-Line defense is truly clamping down—as it did in holding North Carolina to a season-low .788 points per possession on Feb. 27—Virginia looks as if it can starve any offense into enough of a submission for its relatively pedestrian offense to eke it out. The flip side is that the Cavaliers’ offense has at times looked so inept—as it did in its other game against the Tar Heels, when Virginia managed just .678 points per possession itself on Feb. 18, during a four-game losing streak—that it leaves its defense little room for error. In this way, Virginia’s quarterfinal loss to Notre Dame could be concerning. The Irish’s quick-passing, small-ball attack poked holes all over the Cavaliers’ defense, finding open looks inside and out to the tune of 1.198 points per possession, the second most by a Virginia opponent all season. (The highest came from lowly Pitt, the ACC’s 14th-place finisher, on New Year’s Eve.) The Cavaliers managed just nine points through the game’s opening 10 minutes and a middling .978 points per possession overall against a Notre Dame defense that has been short of dominant for the season. That speaks even more to the importance of the Cavaliers’ defense, as it sets the tone for all they do. But being the stingiest unit in the country will only go so far. If Virginia can’t find some points to provide breathing room, it could be vulnerable to an early exit. If you’re looking to buy low on a legitimate Final Four contender, there are few candidates better than the Cardinals. Expected to be a No. 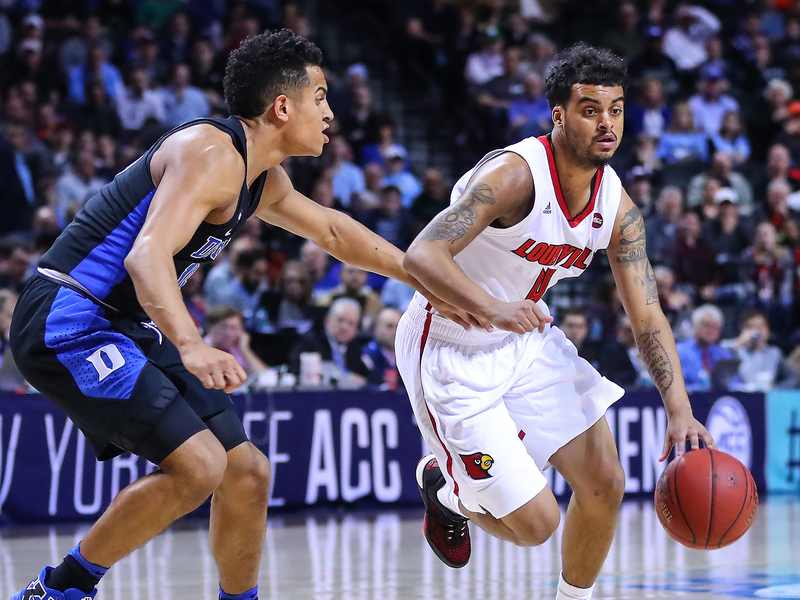 2 seed as recently as a week ago, Louisville does not exactly enter the tournament on a surge of upward momentum, having lost three of its final five games and getting bounced from Brooklyn on Thursday afternoon. Don’t let a bit of recency bias obscure what could be one of the bracket’s best bargains. For starters, Thursday’s loss to Duke has already aged well, as the previously sputtering Blue Devils have been able to translate that showing into something resembling the title-quality team they were expected to be all season. Plus, Louisville shot a baffling 19.0% from three (4 for 21), made worse by how many of those shots were quality looks. If another trey or two falls, the conversation around both teams is much different today. But hey, that’s a sort of recency bias too. When you look at the Cardinals’ whole body of work, you see a team that should be getting more buzz than it is. Louisville has as good a trio of nonconference wins as you’re likely to see in Wichita State, Purdue, and Kentucky (although the latter two were at the friendly confines of the KFC Yum! Center), plus a one-possession loss to Baylor in the Bahamas that could have gone either way. Donovan Mitchell and Quentin Snider are a dangerous backcourt, and 6’7” wing Deng Adel seems to be growing into a larger role, as his numbers have steadily increased each month; both of his 20-point games have come in March. A four-headed monster inside helps make Louisville one of the nation’s best teams on the offensive boards (15th in offensive rebounding rate, with 36.3%) and anchors a defense that ranks seventh in block rate (15.2%) and sixth in overall defensive efficiency. A stellar defense is practically a given for a Rick Pitino-coached team, but this season, with Louisville ranking No. 22 on offense, has he paired that with top-30 efficiency on the other end, which he has done only three times before in the 15-season kenpom.com era. In 2014, it ended in a Sweet 16 loss to eventual Final Four team Kentucky. In 2005 and in 2013, it got them to the tournament’s final weekend. When you’re looking at the bracket and trying to stay away from chalk, that’s something worth keeping in mind.